Shiny spots spoil the appearance of the garments. They usually appear due to improper use or long wear stuff. With the help of improvised means you can try to return clothing to its original appearance. Vinegar, onion, boric acid, refined gasoline, newspaper, baking soda. Dissolve in 500 ml of water 150 ml 9% vinegar. Moisten the gauze in the solution and squeeze lightly. Put it on the table or Ironing Board ruined clothes. Then iron the shiny spot with a warm iron through a damp cheesecloth. A gradual transition from one section to the next, do not forget to wet the gauze. This method is ideal for cleansing black fabrics. Peel the onion from the husk and chop on a grater or in a food processor. In the end, should get mush. Apply onion powder on the stain and leave for 1-2 hours. After this time, rinse the treated area under running water. With this method you can put in order coloured cloth. Prepare a weak solution of boric acid. To do this in a glass of water dissolve 1 teaspoon of funds. Soak the sponge for washing dishes in the liquid and carefully apply shiny spots. After 30-40 minutes rinse the cloth in plenty of water. Print spots with purified gasoline. It can be bought in the hardware store. Wipe the damaged place a cotton pad soaked in gasoline. Before use, test the fabric for resistance to solvent. To do this, apply a few drops of gasoline on the inner seam of the product. If after a few minutes the material has changed color, discard this method. Take a sheet of newspaper and apply to shiny areas. 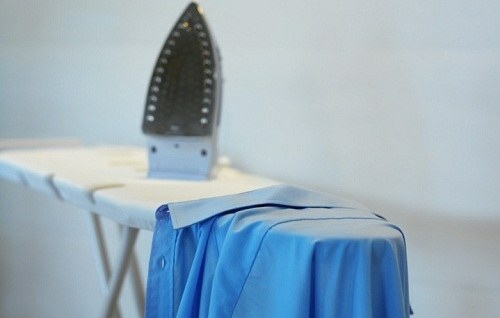 Then heat the iron and gently iron. Be careful - on fabric may lead to an undesirable traces of the inks. Stir in a Cup of warm water 1 tablespoon of baking soda. Dampen a sponge in the solution and grind the material. Then rinse in running water. This method is suitable for removal of stains from silk and woollen fabrics.